← Sussex Transport offer Custom Clearance Warehouse services in Crawley. Not a day goes by that we don’t discuss or move a shipping container. Its simply amazing how many are out there, not just on the water, or full of goods, but empty. Heading for farms, sports teams, onsite stores for construction projects or even for use in a garden as a home office or play room. They are cheap. A used shipping container will cost you somewhere from £800-£2000 probably. And its amazingly simple to secure one. There are thousands about, and a quick search on eBay will yield plenty of results. Some will be in shocking condition, some will be great so tread carefully. Once you’ve got yourself a deal however it needs to be moved. Moving & Transporting empty Shipping Containers is the tough bit. They are not just ridiculously heavy, they are BIG! 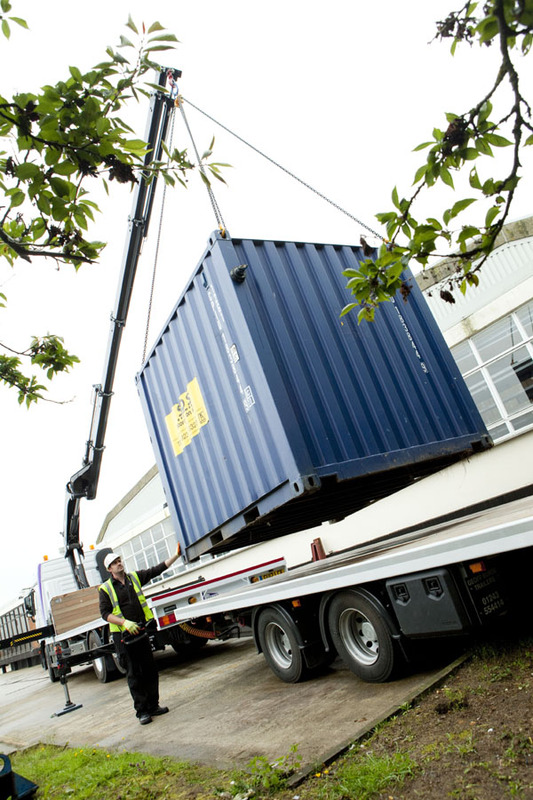 Even a 20′ container will weigh around 2.5t when empty so the vehicle you need to collect it must have a decent crane on board. Along with a pretty good sized bed to sit the container on whilst in transit. These crane vehicles are often called HIABs. A ‘HIAB’ capable of this will likely be around 12m long so you’re going to need space at either end to get the vehicle into / near the location – ideally beside the location. The cranes then have different ratings and although most will be able to lift the 2.5t that a 20′ container weighs they differ greatly in how far they can lift that away from the vehicle. Add a tight road or drive, overhanging trees, the need to lift over a fence, wall or garage into the mix and you’ve got a pretty regular occurrence in our world. They can all be overcome with some careful planning, an expert transport team, skilled drivers and and quality crane vehicle. That’s where we come in. Specialising in Container moves across the South / South East of England, but regularly going far further afield why not give us a call to discuss your requirement. This entry was posted in Delivering to..., News, Surrey Road Haulage, Where are Sussex Transport going..., Where are Sussex Transport... and tagged Container haulage, container transport, hiab shipping container. Bookmark the permalink.